Millions of travelers come to Playa Del Carmen each year to take a leisurely stroll on the white sand of the gorgeous beaches!!!! The beautiful, turquoise water, palm tree-lined, white sand beaches! Everyone comes to the beach when visiting Playa Del Carmen so you might as well make the most and see the best ones. Everyone you ask will have a different favorite beach and for very different reasons. PARQUE FUNDADORES – This beach in front of Parque Fundadores is good for taking a leisurely stroll starting from Juarez until you reach 5th Avenue, and you will see the gigantic ‘Playa del Carmen Arch’ right in front of you. The wide beach is dotted with small restaurants and beach bars. Indeed it is a great place to get into a game of volleyball and soccer. Here you’ll find a real mix of people from tourists to local families. The most unusual thing about this stretch of beach is that there are no beach clubs, so you get a true community feel, with everyone spreading out onto the sand. 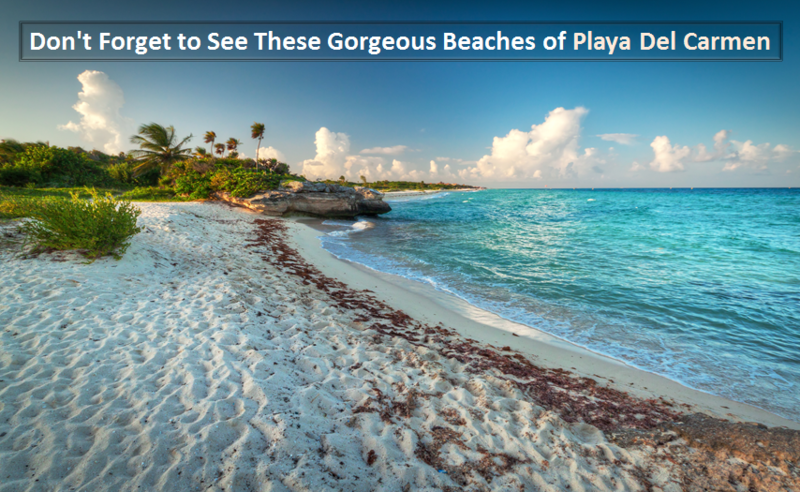 It is considered to be the most iconic beach of Playa Del Carmen. CALLE 10 BEACH – Although there is nothing special about the sand or the sea in this area of Playa del Carmen, the bountiful Yacht Rental in Playa Del Carmen and the activities onboard makes this beach so very special. This beach has also greater access to some of the most popular beach clubs and beach beds followed by impeccable services. Going any further north up the beach, the beach gets small and then around 16th St. you get more seaweed and yacht charters waiting for their clients. Calle 10 attracts both locals and tourists but maintains a very laid-back, tropical vibe throughout the day. MAMITAS BEACH – It will always be the most famous of all the beaches in Playa Del Carmen regardless of the thought that there are more humans than grains of sand. It is harder to access this beach but it is a pure beauty of Playa Del Carmen. For all snorkeling enthusiasts, this is the perfect beach to try snorkeling off the shores of Playa Del Carmen. Whether you’re looking for vibrant coral reefs, extreme cave exploring, cool freshwater pools, gigantic sea turtles or sweet little schools of tropical fish this beach has you covered. The beach is located in front of the club so you also have an option to relax at the beach near the crystal clear waters amid lush green surroundings. PLAYACAR BEACH – This is a very wide beach where you can enjoy complete tranquility away from the hustle and bustle of the tinsel town. People come here to bask lazily in the sun. The water is usually free of seaweed and is great for swimming. This beach also serves as a good place for sports as well. You will see some kite surfing here on windy days. The sea in this area is a little bit clearer and a even more blue, if that is possible, than the sea close to the center of Playa del Carmen. Playacar beach is also dotted with cute little palm trees, that offer some much-needed shade throughout the day. Once here do not miss out on the scuba diving opportunities to get acquainted with the marine life. If you want to explore and discover more beaches while on your visit to Cancun, hop on the yacht charters in Playa Del Carmen and under the hospitality of a professional crew head to the coast of Riviera Maya. Riviera Maya is home to many beautiful beaches where you can be part of adrenaline pumping water sports activities such as scuba diving, snorkeling, kayaking, swimming with dolphins or whale sharks, fishing, whale watching adventure to name a few. We hope, whatever beach you go to here in Playa Del Carmen of the Rivera Maya, you have a great time.